Buy Live Firefish Peacock Cichlid Aulonocara sp. "Firefish Dragon Blood"
Aulonocara sp. "Firefish Dragon Blood"
This beautiful fish goes by many names a couple of them are Dragon Blood, and Gold Peacock. These fish are not natively found in the wild. No one is quite sure how this fish came to be. Firefish peacock temperaments are similar to other aulonocara species. Firefish peacock cichlids will readily accept most foods presented to them. Feeding them our Plankton Gold flakes will help bring out more of the red coloring in them. 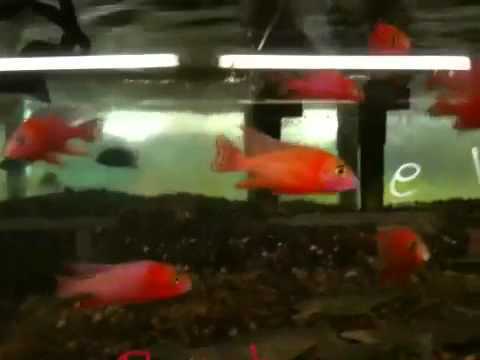 We have many bright colored aulonocara Firefish for sale. Don't forget to order 3 or more to save with our bulk order discounts. Gorgeous males, a must for every tank! !